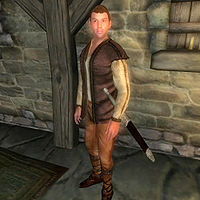 Alix Lencolia is a Breton crusader who is currently staying at Faregyl Inn, south of the Imperial City. He is the master trainer in Blade. Alix really doesn't have much of a life; when he is not conversing with the other two inhabitants at the inn, he wanders around without even sleeping or eating, which means he's available for training 24 hours a day. He wears a brown shirt, doeskin shoes, and tan linens. He wields a silver longsword and supplements this with a leveled set of crusader spells. Once your Blade skill has reached 70 or above, the two advanced trainers, Rhano and Sherina will tell you what a legend the reserved Breton truly is. Rhano will say: "I certainly can't teach you anything more. But if the rumors are true, and Alix Lencolia is passing through Cyrodiil, he might be able to teach you. He'll be truly famous one day. Word already spreads about his skill... I think someone saw him at Faregyl Inn not too long ago. You should try there." Sherina will concur and add: "If you're looking to learn even more, experience is your best bet. If you want pointers, I hear that Alix Lencolia is somewhere in Cyrodiil. Don't tell me you've never heard of him! He's famous for his skill with a blade. And at his young age.... He'll be a legend one day, mark my words. I heard that he was on his way to one of the Southern provinces, seeking fame and fortune. Maybe try an inn along the way, like Faregyl." "Oh, I don't think so. As much as I enjoy helping those less fortunate than I, I just can't bring myself to do it." "I've heard you mentioned in hushed tones. Quite the evil doer, are you? Well, what's infamy but another type of fame, after all. If you need to improve your skill with a Blade, I'll happily teach you what I know. Imagine how many people will talk if we're seen together?" "I've heard word of your great deeds. It's good to meet someone else striving to be known throughout the land. We're peas in a pod, you and I. I'd be happy to offer whatever help I can." If both your Infamy and Fame are at least 20, Alix Lencolia will use the Fame dialogue even if your Infamy is higher than your Fame. Esta página foi modificada pela última vez à(s) 16h20min de 27 de março de 2015.